Seaglass Chorale, under the direction of Jean Strazdes, Artistic Director, will present a tribute to Leonard Bernstein in celebration of what would have been his 100th birthday (1918- 2018). Performances will include selections from West Side Story, Wonderful Town, Candide and others. 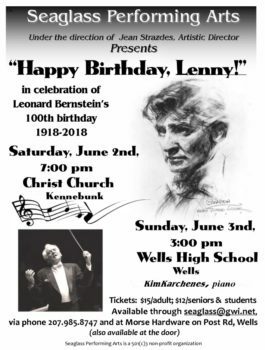 Concerts will take place on Saturday, June 2nd, at 7:00 pm at Christ Church in Kennebunk and Sunday, June 3rd, at 3:00 pm at Wells High School in Wells.